This is the pink blooming tree to the right of the white blossoms in the center. 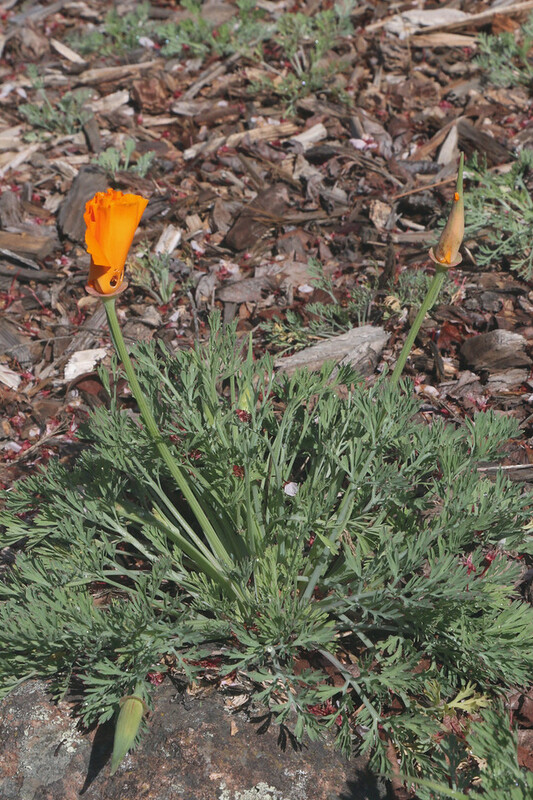 The one on the left is also blooming but the light wasn't good for photographing it. The photo last year was taking on Groundhog Day, February 2nd. So these trees are blooming almost a full month earlier than last. 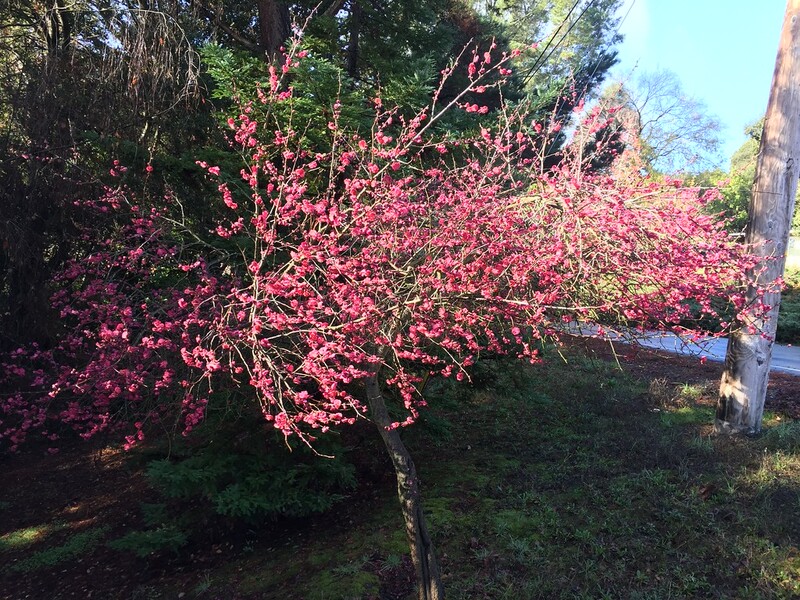 I assume that the warmth of this past December allowed these trees to bloom so early. If you don't believe it, I can't blame you - I can hardly believe it myself! As you can see the white plum tree is now in full bloom and the two pink trees have some flowers. I believe the one in the background may be just starting. These trees are getting more sun than I recalled from last year, but it could have been the extremely wet weather that fooled me into thinking they were in the shade all the time. 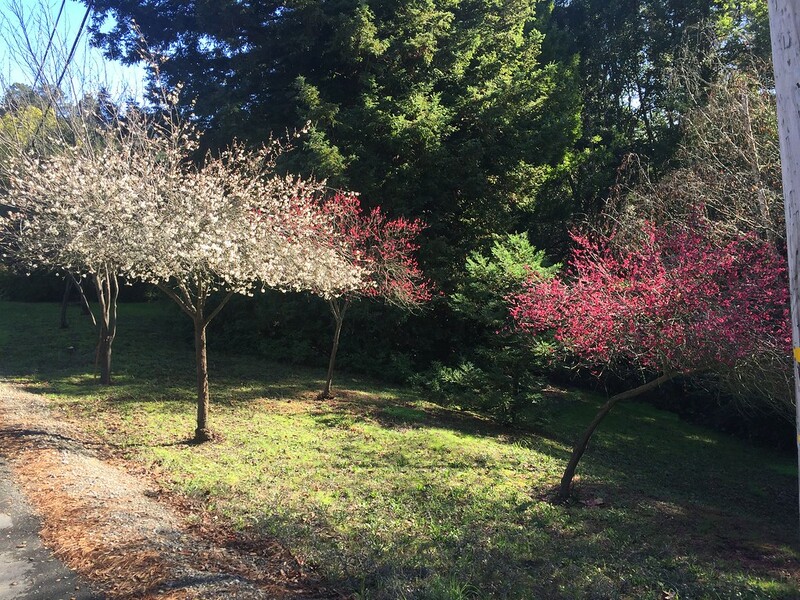 Even so, there is a line of white plum trees across the street that get much more sun than these three trees. I have no idea why these trees are blooming so much earlier than everything else. The two pink trees might cross-fertilize each other, but the white tree most likely won't have any fruit because it bloomed so much earlier than any other tree of its species. 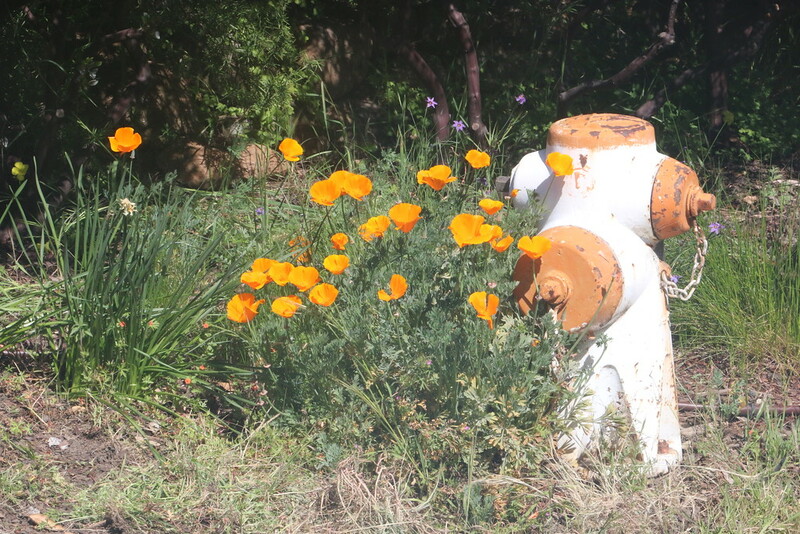 Definitely sign me as "confused in California" . . . . . .
Dear WeatherCat observers of the season's turning. 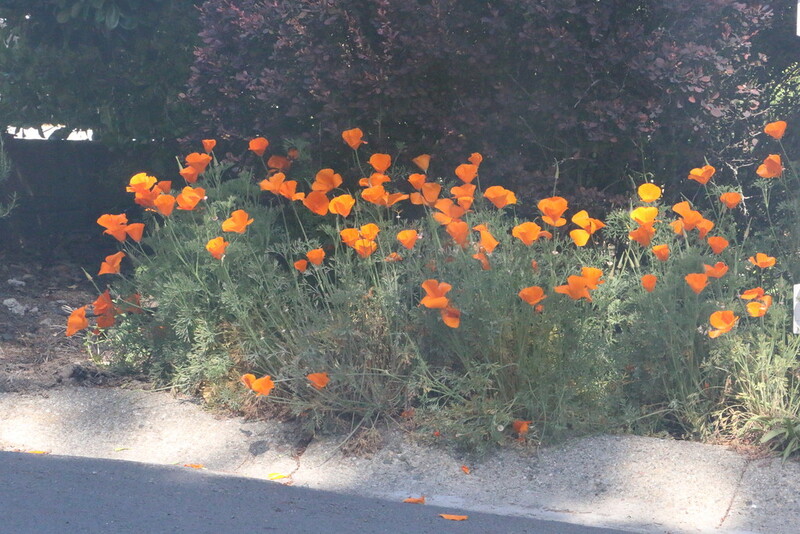 I hope that's a bit of spring cheer no matter what you see outside your window tomorrow. The two pink blooming trees in the background still don't have any leaves. The tree that blooms white has just started to produce leaves. 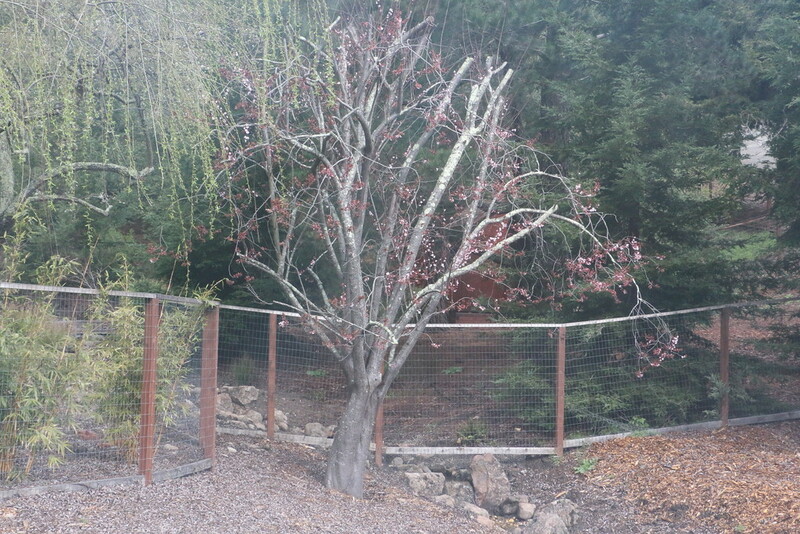 If you compare its progress to the plum tree on the extreme left, it has barely started to produce leaves while the larger tree is almost in its normal leaf configuration. I had thought that all three trees had somehow died shortly after blooming in January. It would have been a surprise considering the mild weather, but it was possible. However, clearly the white blooming tree is alive. I've never known of trees that could bloom and return to being dormant for a while before finally sprouting leaves. So this is definitely a new one on me. 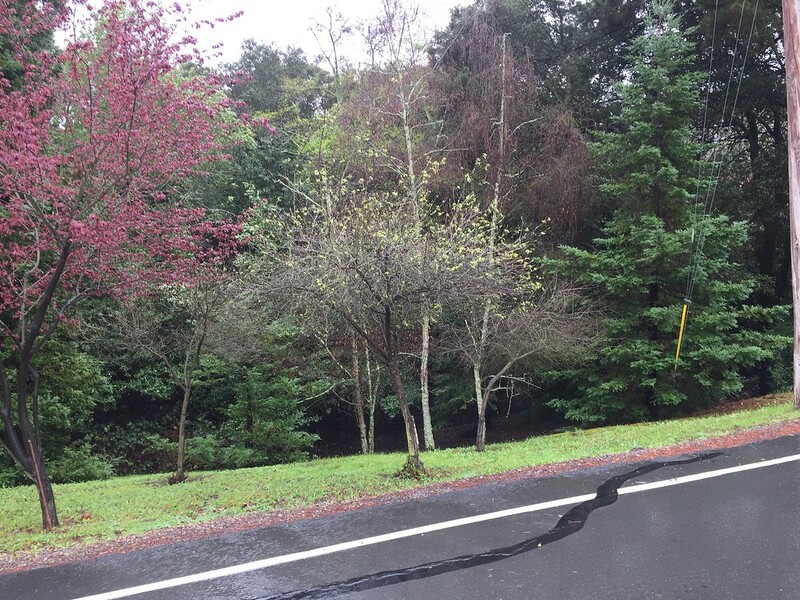 Will the pink blooming trees finally come to life after all? Stay tuned! After a wet March we are continuing to have some impressive storms blow through. Thursday through Saturday we had another atmospheric river event that was transporting water vapor equivalent to 25 times that of Mississippi river! Because its source was near the Hawaiian islands it counted as a genuine "Pineapple Express." As a result we picked up 2.33" of rain (58.2mm). Since the seasonal rainfall is about 1.5" for the entire month of April we are already over 50% over the normal for the month! 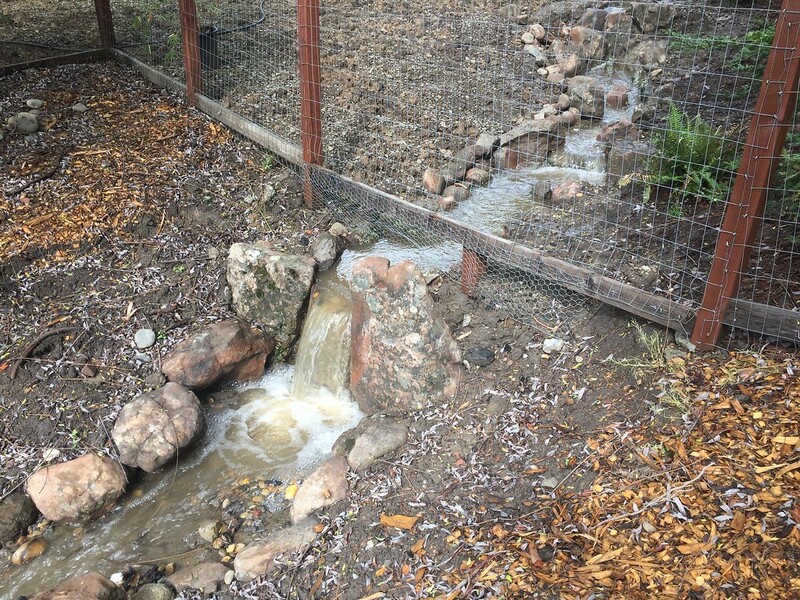 Indeed, 2.33" exceeds all the rainfall we could expect through June, so any additional rains will further refill the totals and the reservoirs. It appears we'll continue to get rain for at least the next two weeks. It is very unlikely we'll catch up on the lost rain of December and February, but every bit helps. 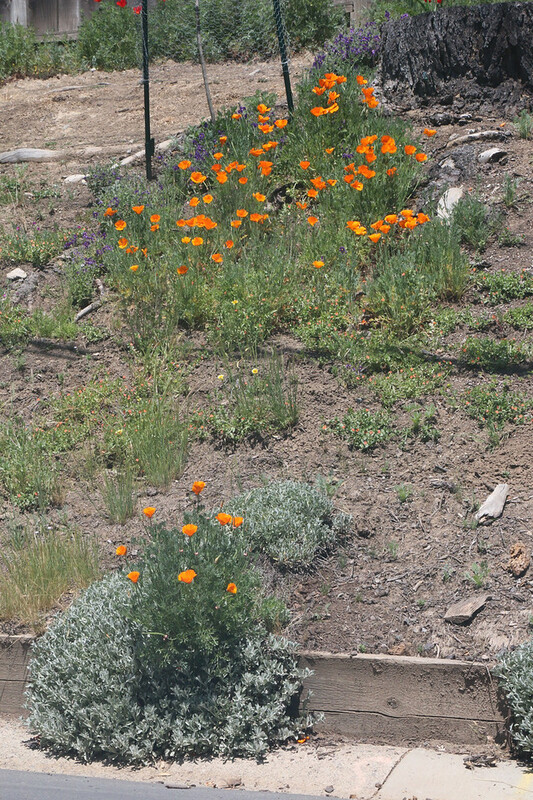 The longer rains continue into the Spring, the later one has to start watering in earnest. That will further stretch our limited water reserves. Let it rain! . . . .
. . . . . Are you kiddin'!! Have you looked at the educational ranking lately? In California we are having a hard time teaching "humans" (or what passes for them) to read!! . . . Unfortunately, deer or humans alike, keeping them out of private property takes stronger measures than simply relying on the "good nature" of others. The deer can easily jump 10 feet if they are hungry enough. The only really viable solution is to block their view of what is on the other side. They won't jump if they cannot see what they would be landing on. That's how we have managed to secure a small fraction of our yard. The contrasting blue flowers in the background provide spice to the scene. 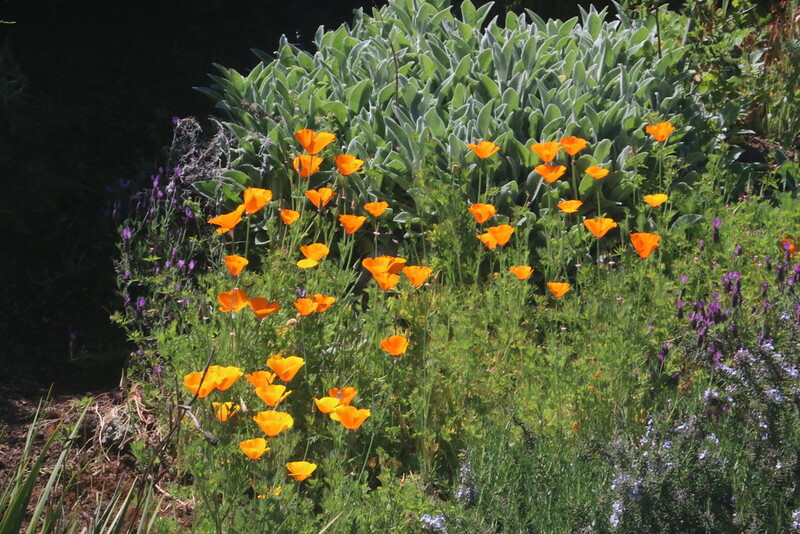 The California Poppies will continue for a week or two depending on the weather. However, as soon as the heat really start drying out the soil, they will hide until next Spring. 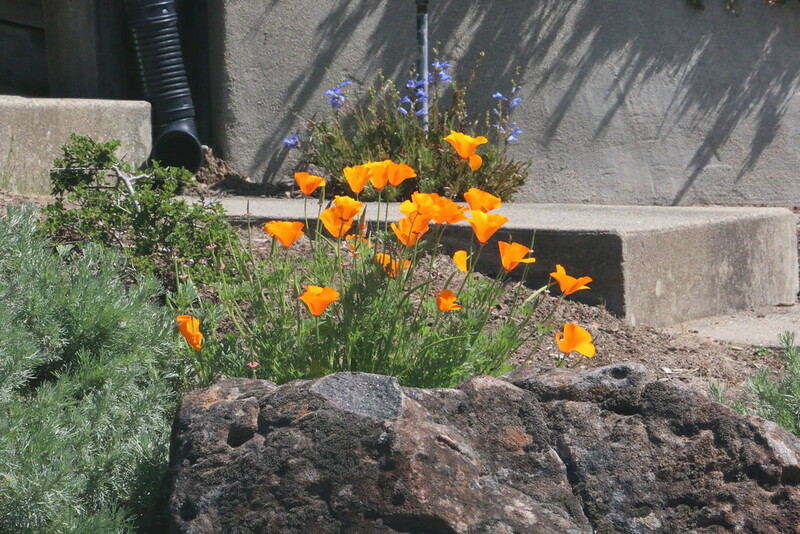 Here are a few more California Poppies from around the neighborhood. 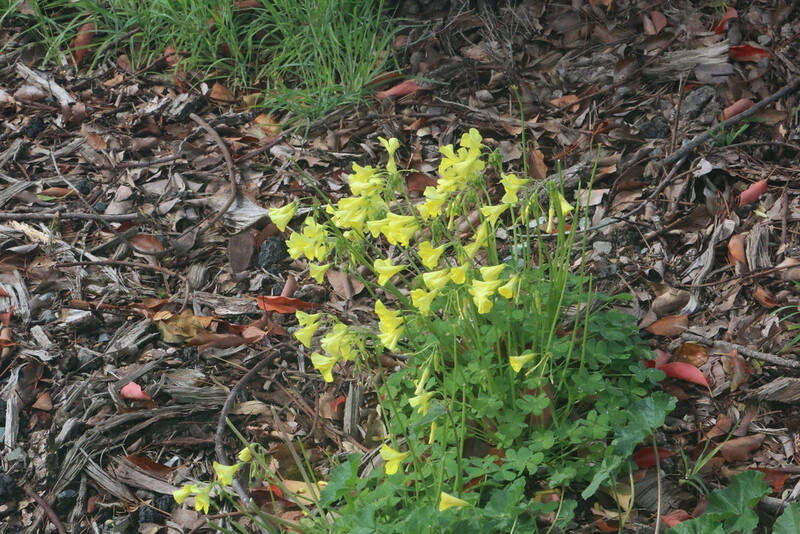 This example is clearly from a well cared for front yard and can hardly be considered wild. 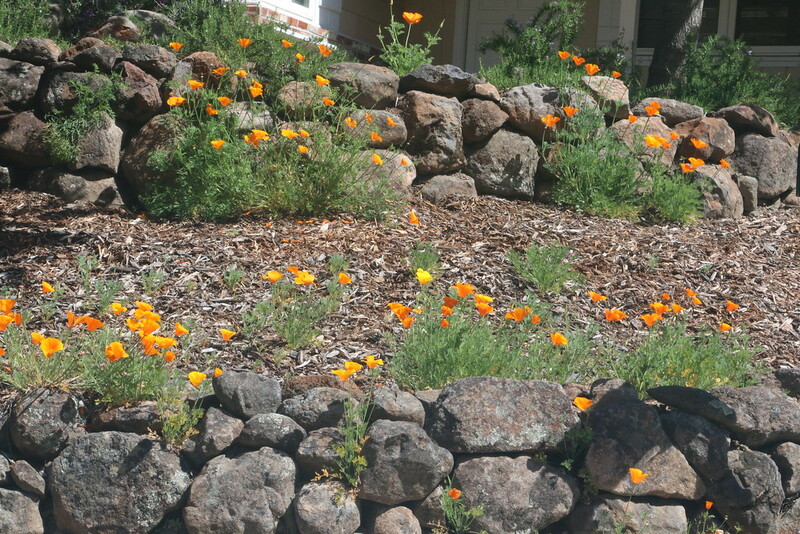 This sort of coarse and rocky soil is difficult for any plant to grow in - even poppies. However, one they get established, they have very deep roots so they can cope with these conditions and come back year after year. Today it has been cloudy and we even got 0.01" out of the drizzle. 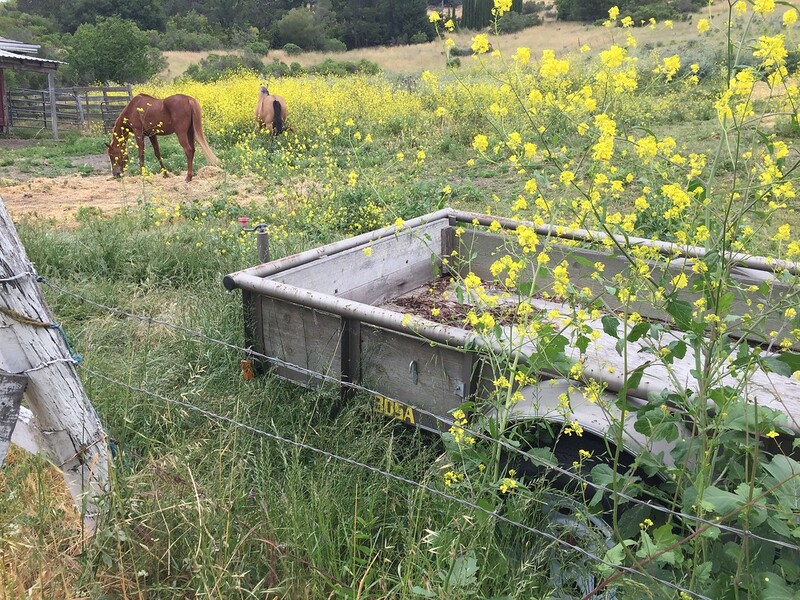 However, besides the mustard the grasses are brown and turned to seed. 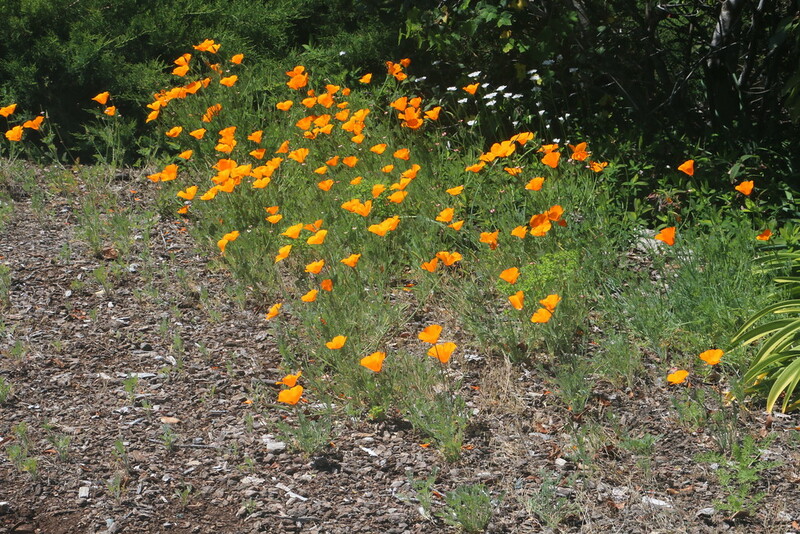 Monday may be the unofficial start of Summer, but here in California the dry season is definitely upon us.